This beautiful Emporio Armani AR5905 watch comes in a sleek black design with rose gold-plated accents. Featuring large hands, three subdials and a handy date display, this trendy timepiece would complement any outfit – whether it’s a swanky suit or a T-shirt and jeans. 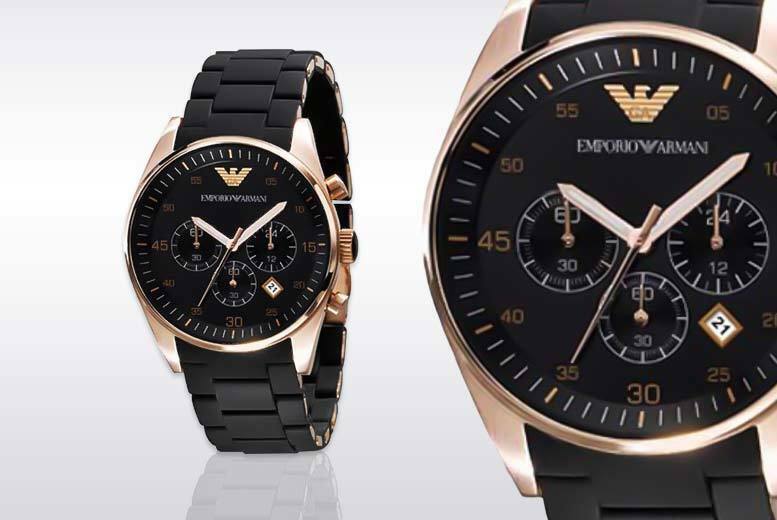 Get a stylish men’s Emporio Armani AR5905 watch. Black with rose gold-plated accents. Black bracelet and face featuring three subdials and a date display function. Finished off with the trademark Armani logo for a touch of class. Comes in a presentation box to make the perfect gift for that special man! To complete the design, this lovely watch is finished with the trademark Armani logo. Making the perfect present, it also comes in a presentation box and includes a two-year warranty! Lovely!